What happens to the figure-ground relation in the absence of a figure? Or if it lacks a representation of a body? Can a body be represented sans figure? Is there more than one way to formulate a body and depict it in a less iconic modality? Which is to say, can the body in all its complexity be represented at all, let alone be set against a “ground”? The work of Theresa Ganz answers these questions in the affirmative. Hers is an art practice that deals with the complex body. Which might be understood as a body that is consubstantial with its background—the ground is the body and vice versa. In this sense Theresa Ganz is an environmental artist. Or: she is a landscape artist for the 21st century. A century where we now know empirically that human life is intricately woven into its environment. There is no standing out from the ground or apart from the environment. No creature feels this more acutely or is more symbolic of this situation than the ice-deprived polar bear whose physiognomy is rapidly changing due to the radical change in its environment. Animals all, we too are tied to the earth, and the figure-ground relation seems to have turned out to be something like an illusion in the face of global climate change. If these observations echo certain strains of New Age Environmentalism they share an affinity with Ganz’s own stated interest in thinking about sacred space. In recent works Ganz takes the Ellora Cave temples in India as primary source material to generate her complexly layered photo-collages. Rather than focusing on the impressive temple structures at the holy site, the artist chooses to examine the carved-out walls and the traces of handiwork that went into demarcating the human investment into the caves to create the sacred space. Ganz too is invested in creating something like sacred space, to dizzying effect, through her complex and compositionally rich photo-collages. The compositions make the word “photo-collage” seem like a wild misnomer when encountering the works themselves, which in their phenomenological scope and hyper-attention to detail could more rightly be understood as environments. The art, then, is not simply about picturing space but instead making the picture spatial. This is no doubt an abstract circuit I am trying to describe. Put simply, it is the idea that an image makes a world and the world could be found in an image. With Theresa Ganz’s work there is always a shuttling back and forth between these two conceptions of space. This is the investment that constitutes what I’m calling the complex body and another way of articulating the breakdown of the figure-ground binary that recurs throughout the artist’s oeuvre. Investment. A loaded term, to be sure, whenever we are discussing art, religion, or space. No doubt the Ellora temples required an astronomical investment. They are not simply temples but temples carved out of a mountain. It is almost impossible to imagine that level of an investment in labor and devotion. It is incalculable really. Incalculable. Incalculable is our contemporary secular equivalent for the divine. Something that surpasses our earthly ability to comprehend and defies human expression. the impossibility of increasing the inner glory of God translates into an unlimited expansion of external glorification by men...What cannot be increased—glory in the first sense of the term—demands an infinite increase of glory in the exterior and subjective sense. In Agamben’s examination of the church/governmental apparatus of power we see that the figure-ground relationship in the concept of glory is likewise confused: god is glory but glory requires glorification by human subjects. Glorification creates excess in its striving to attain glory. This is the Baroque in its most basic articulation. 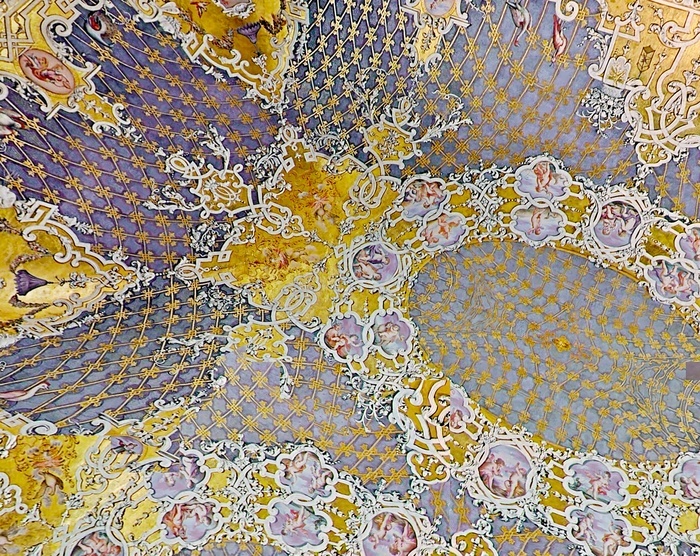 In her latest suite of works for Aqua Art Miami, Theresa Ganz turns her attention to the Baroque and glorification found in the palaces, castles, and estates located throughout Europe via the Google Cultural Institute. It is a street view tool that allows people, in something like three dimensions, to remotely and virtually walk through famed cultural institutions. The ornamentation present at places like Versailles, the Château de Fontainebleau, and the Schönbrunn Palace taps into glory or glorification. In these locales the focus of glorification has obviously been moved away from the church and turned towards imperial power and dynastic wealth. In this new body of work Ganz performs something like a détournement on the halls of power by rendering them kaleidoscopically abstract. By using the Google Cultural Institute as material and the keyboard as a tool for collage she is able to wrest the glory from its process of glorification. There is something democratic in the use of the Google technology. Today anyone can visit these sites virtually if they have access to a computer. But it’s complicated, as Google is yet another kind of Rex—the most dominant search engine on the planet in the age of information. Is Ganz’s latest work a political gesture or commentary? Perhaps, but it feels more like wonder at the art and artisans that made the glorification possible. 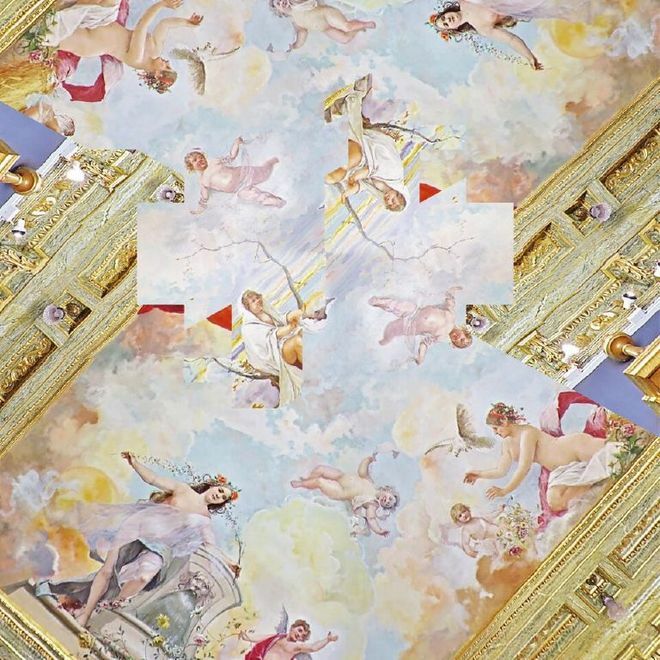 The artist’s wonder finds its form in the re-articulation of these Baroque interiors. Where windows and walls become pure color and molding becomes lines in a vortex of abstraction. Figures get confused with grounds. Glory is uncoupled from glorification. A bright body emerges. Something that is at once angelic and demonic. The complex body, it turns out, is art. This essay was first published in the ArtSlant Prize 2015 Catalogue, on the occasion of the ArtSlant Prize Shortlist exhibition at Aqua Art Miami, from December 2–6, 2015. Theresa Ganz is the ArtSlant Prize 2015 Grand Prize winner.